My license should be valid for a longer time. This date is not an actual key expiration date, it's a date of the next host update, when your Parallels Desktop copy will connect to the licensing server to verify the license validity. Make sure the Mac is connected to the Internet on the indicated date. With Internet connection the copy will be successfully updated till the next update period. Note: A Parallels Desktop activated with a Business Edition license can work offline during the billing cycle, i.e. after activation and before the next host update date. Connection is compulsory for activation and future renewals. If there’s no Internet on the renewal date, Parallels Desktop will not be able to check the license and will stop working due to an expired license. 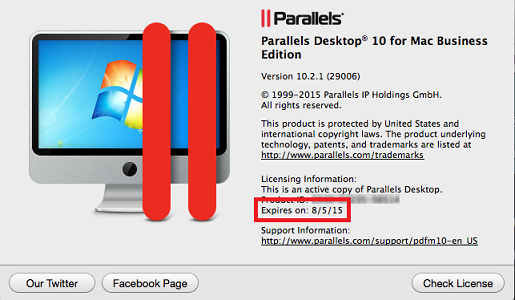 A Parallels Desktop Business Edition key was issued on Apr 26, 2015 and expires on Apr 26 2016. The copy connects to the licensing server every two months. It is necessary to make sure the machines using this license are connected to the Internet. The copy validity will be auto-extended for the next two months on June 26, 2015, and the expiration date will be changed to August 26, 2016.